Phulkari, an embroidery technique from the Punjab in India and Pakistan literally means flower working, which was at one time used as the word for embroidery, but in time the word “Phulkari” became restricted to embroidered shawls and head scarfs. Simple and sparsely embroidered odini (head scarfs) and shawls, made for everyday use, are called Phulkaris, whereas garments that cover the entire body, made for special and ceremonial occasions, are known as Baghs ("garden"). The main characteristics of Phulkari embroidery are use of darn stitch on the wrong side of coarse cotton cloth with coloured silken thread. 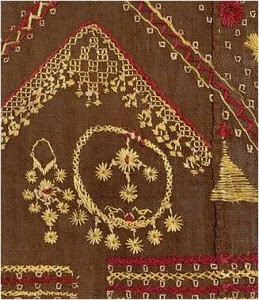 Punjabi women created innumerable alluring and interesting designs and patterns by their skilful manipulation of the darn stitch. 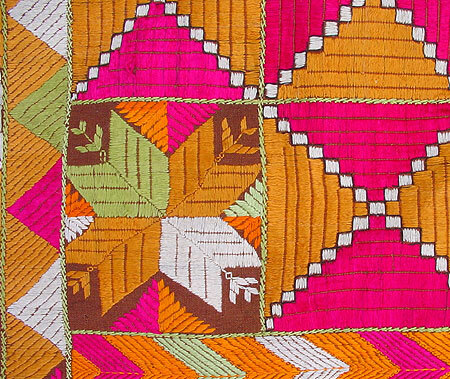 The base khaddar cloth used in Western Punjab is finer from those of Central Punjab. Black/blue are not preferred in Western Punjab, whereas white is not used in East Punjab. 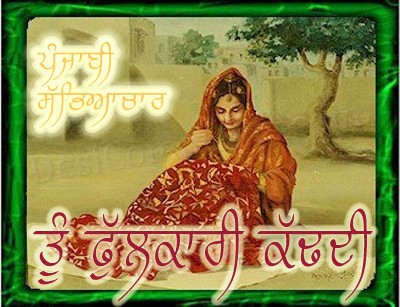 In West Punjab, 2 or 3 pieces of cloth are first folded and joined together. In East Punjab, they are joined together first and then embroidered. In Phulkari embroidery ornaments the cloth, whereas in Bagh, it entirely covers the garment so that the base cloth is not visible. The end portion of pallav of Phulkari have separate panels of exquisite workmanship of striking design. No religious subject or darbar scenes were embroidered. Phulkari encompassed life in the villages. The embroidery is very simple but the color combination, stitches and the pattern makes it look spectacular and gorgeous. It is created on all sorts of cloth and is used in various ways. Today phulkari is not only seen on garments but can also be seen on bed sheets, pillow covers, curtains, wall hangings etc. "Kadd kasidha paihren choli, tan tu jane nari"
Phulkari and Bhag are embroider clothes made and worn by the women from Punjab in north India. 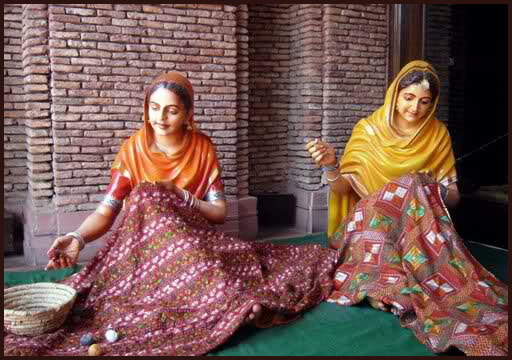 In phulkari, the embroidery ornaments the cloth whereas in a bagh it covers every inch of the entire ground as much so that the base cloth is not visible at all. Phulkari is traditionally made on Khaddar fabric which is hand spun and a handloom fabric. Khaddar is strong and long lasting. The fabric is used as a wrap or shawl.
. Embroidery in Japan .